The annual CEO Sleepout on Teesside was held at Preston Hall Museum. Pic by Doug Moody. Business leaders from across Teesside braved the cold to raise £24,000 and take a Middlesbrough-based national charity’s fundraising fight against homelessness and poverty past the £2m mark. Since the first CEO Sleepout event took place at the Riverside Stadium in 2013, the cause has gone national, with sleepouts taking place at venues such as Wembley Stadium, Lord’s cricket ground and 14 events scheduled next year in cities across the UK including London, Manchester, Newcastle, Sheffield and Nottingham. And 63 hardy business leaders and directors took part in the latest annual Teesside edition of the event as they swapped their suits and the comfort of their own beds for winter woolies and a freezing and rainy night spent in sleeping bags on the Victorian Street at Preston Park Museum. The money will be divided between Teesside-based organisations and charities including The Salvation Army Middlesbrough, Middlesbrough Neighbourhood Welfare, Middlesbrough and Stockton Foodbanks, Home Start Teesside and The Moses Project in Stockton, while the CEO Sleepout’s own charity restaurant The Fork in The Road will also benefit. CEO Sleepout national coordinator Bianca Robinson said: “The spirit and willingness of business leaders to get involved never ceases to amaze me, and it couldn’t be more fitting to pass the fantastic milestone figure of £2m in the place where it all began for us on Teesside. “Homelessness and extreme poverty shouldn’t be happening in any day and age, let alone now, and even though it has unfortunately become a sad reality of modern life as a charity we are constantly committed to doing all we can in the fight against it. Among those who took part were Mark Kenrick and Mark Willis from PX Group, CourseBox CEO Mike Styan, Ramsdens financial director Martin Clyburn, Marie Kilgallon, director of Marie Kilgallon Associates, and Build Directory MD Alisdair Beveridge, who slept out for the second successive year and described the experience as “always humbling and eye-opening”. “There’s an old saying that you can’t understand someone until you’ve walked a mile in their shoes and the CEO Sleepout is something I’m massively passionate about, because I can’t abide seeing homelessness and people in poverty,” he said. 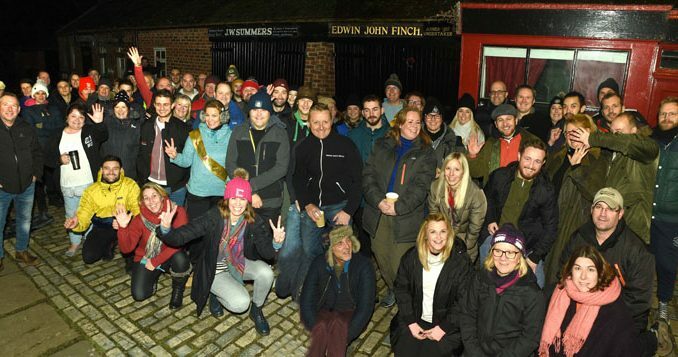 The event followed on from the first-ever Darlington CEO Sleepout at Mowden Park Rugby Club, which featured 30 bosses and raised over £20,000.